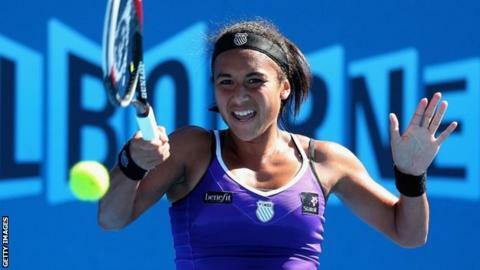 Heather Watson produced a miraculous escape from three match points down to beat Ksenia Pervak and reach the third round of the Australian Open. The British number one, 20, looked as good as out when she trailed the Kazakh by a set and 6-3 in the second set tie-break on a blisteringly hot Court Eight. But Watson refused to buckle, finally finding her rhythm from the baseline at the crucial moment, and she battled back to win 4-6 7-6 (9-7) 6-2 after three hours and two minutes. She will play in-form fourth seed Agnieszka Radwanska in the last 32. That will be a mighty test against a player who has won all 11 matches and two titles in 2013, but that is a concern for Friday. For now, the world number 50 can reflect on a day when her tennis was way below par but her fighting spirit proved irresistible. "I do make it hard for myself but a win's a win, no matter how you do it," Watson told BBC Radio 5 live. "It was a very tough one today. I wasn't sure whether I was going to get through it but I did, I kept fighting, the crowd was amazing and kept pushing me on from start to finish, and I've put myself in a position to play another match here. "You've just got to keep fighting and fighting, because it's never over until that last point's done. "She's a tough opponent, she makes every single ball. I didn't win a point until the eight or ninth point of the match. She wasn't going to give me anything, but you've just got to fight through and find a way." Pervak, 21, was the better player in the early stages, breaking to love in the opening game and deservedly edging a scrappy first set with three breaks. When she moved 2-0 clear in the second, only the noisy contingent of British fans on the outside court seemed to believe Watson was still a contender. But while the errors continued to flow from the Guernsey-born player's racquet, the winners began to come as well. Watson hauled herself back level and forced the tie-break, but it looked like merely a stay of execution when some wild errors helped Pervak to 6-3. With defeat apparently inevitable, Watson loosened up and began striking with real freedom as she pounded from side to side on the baseline. The deficit was erased and, at the second opportunity, the Briton converted set point to level the match. Pervak, ranked 82nd, immediately headed for a bathroom break and took some time to return, presumably castigating herself for letting such a golden opportunity slip by. Within 25 minutes she found herself 4-0 down in the decider against an opponent apparently struggling with cramp, but at the same time cleverly mixing up her game. A nerveless love service game gave Watson victory and, understandably thrilled, moments later she was in an embrace with the British supporters gathered courtside.